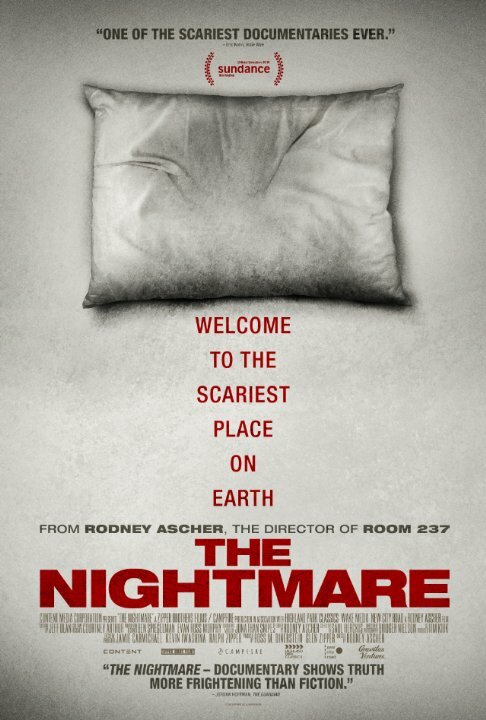 The Nightmare is the new documentary from Rodney Ascher, the director of Room 237 which delved into Kubrick's The Shining. Much like Room 237, The Nightmare is a documentary that focuses on the human perception of reality as opposed to a factual or scientifically based approach. The subject matter here is sleep paralysis, a topic that is more frightening than your average horror film setup because it is a real condition. The Nightmare has a pretty simplistic approach to what it wants to say: it films 4 subjects telling of their sleep paralysis condition and reenacts their stories as they tell it. The scenes play out like a Hollywood horror movie as the people explain what happens during sleep paralysis in voice over. The scenes are played up for maximum effect and are executed superbly to create an extremely creepy atmosphere. The people tell of shadow men in their rooms at night, seemingly alien visitors, and demons whispering into their ears. All of this as they lay awake paralyzed and helpless, just waiting for the episode to end. These reenactment scenes are very scary and make great use of sound and music. The music is very eerie and full of tension and the sound is created to stay with you, especially the voices of some of these unwanted nightly visitors. There were a number of times I felt the hair on my arms stand up, that's how effective and chilling these stories are portrayed, with one moment in particular that made me literally jump! An interesting choice that I thought worked well was that as the movie jumped back and forth from the 4 people and their experiences it separated each segment with a quote from the upcoming segment that wasn't said yet. It gives the viewer a kind of precursor as to what will be addressed or discussed and works as a link among the people and gives the film a nice sense of unity. The interviews themselves are dimly lit with the camera set back a little ways so the viewer sees the subject lit up and a lot of the darker room in which they sit. As they tell the terror of their sleep paralysis, it is almost as if we expect to see long and lanky shadow men come out of the dark areas that stretch across the room behind them. It's a nice touch that plays on the confusion and terror of sleep paralysis itself by blending awakeness with sleep, reality with dreams, and lightness with the dark. The Nightmare is a new breed of documentary. It relies on story to tell it's truth. The Nightmare never gives us any scientific research on sleep paralysis or any potential physiological explanation as to why this condition occurs. And perhaps it doesn't need to. The condition is very real and extremely scary to the people that suffer from it and no explanation will comfort them. The viewer is given lore and legends from around the globe that span all time depicting the terror of sleep paralysis and maybe that's comfort enough to the victims of it, knowing they are not alone in their suffering. Then again, they all suffer alone when sleep paralysis hits, and that is absolutely terrifying. Watch this movie and be warned: some of this might seem familiar to some viewers and you'll probably go to sleep a little nervous.